The Coking home (left) sits alone in the center of casino property. 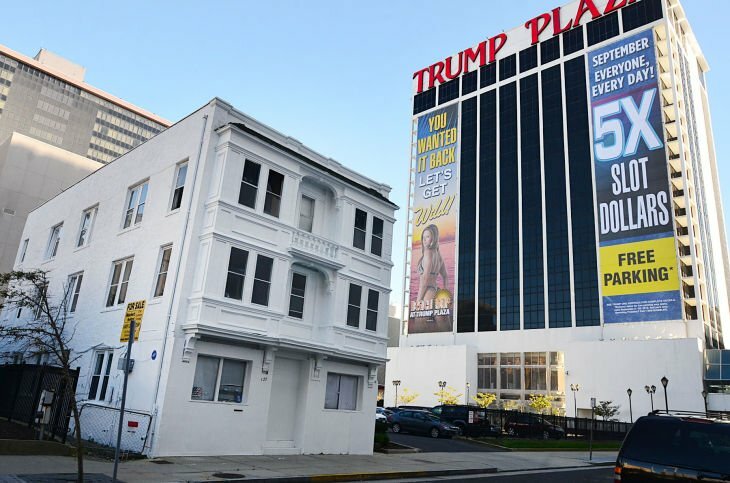 The home Vera Coking refused to sell to Donald Trump adjacent from the Trump Plaza in Atlantic City is up for sale at a drastic reduction from its $5 million asking price in 2011. Now it's $995,000. Vera Coking and her husband wear hardhats as their home is surrounded by steel beams in July 1979. Decades later, the lone house dwarfed by Trump Plaza Hotel and Casino still sparks a memory or two. "Remember?" the woman asked her male companion Tuesday as she crossed Columbia Place. "This is the house that woman wouldn't sell to Trump." Vera Coking, now 85, gained national attention when she refused to sell the former 29-room boarding house to Donald Trump. Now, the home has been on the market two years, resulting in a multimillion-dollar reduction in price from $5 million to $995,000. "Who's going to buy it?" 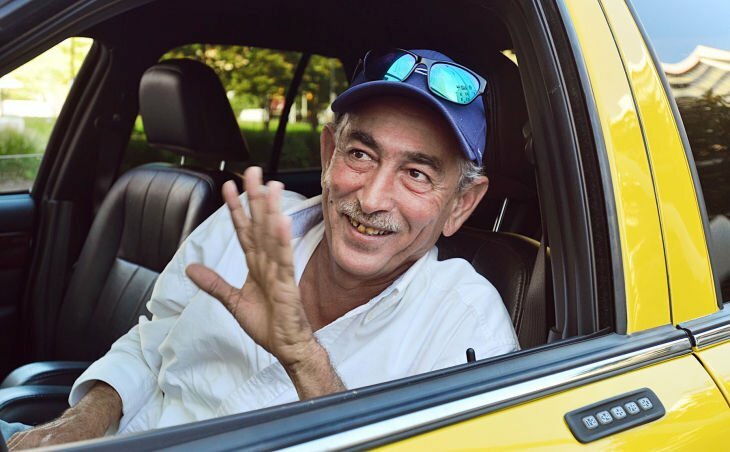 asked Abdesslam Bouchouir, sitting in his Yellow Cab near the home. "What are you going to do here even if you buy it?" "Why doesn't Trump buy it now?" asked Max Gonzalez, visiting the area Tuesday from Manhattan. "There's a lot of history there. Take that house." "I was just thinking about that as I walked by today," said Bob DeFederico, of Woodbury, Gloucester County, as he walked on the Boardwalk near Trump Plaza. "I wondered if it was still there." He had heard the stories about million-dollar offers and of Coking getting a free room for life at Trump Plaza in exchange for selling the house. "I think that's amazing," said Laura Peters, of Staten Island, of what she called the woman's "I'm here. Take that" attitude. Coking wasn't the only one who fought Trump. Clare and Vincent Sabatini also refused to sell their Sabatini's restaurant to the casino mogul. That battle was captured in the comic strip "Doonesbury" in 1997. When they decided to retire in 2005, they did sell, getting $2.1 million for the restaurant that the Casino Reinvestment Development Authority offered $750,000 for seven years earlier. In 2006, Coking said she was offered $250,000. Trump's president at the time disputed that figure. But it wasn't about money for Coking, said Bouchouir, who knew the strong-willed woman who "talked to only the people she liked." "I don't need the money," she would tell him. "I just want to stay in my house." She insisted on staying put first through the building of Penthouse publisher Robert Guccione's ill-fated casino, which began in 1979. For years, she would live with a "cage" around the home - the steel superstructure of Guccione's partially built casino. The construction team put up a tarp to protect the house as construction went on around Coking. In the 1990s, after Guccione pulled out, Trump removed the cage and razed what had been built. But his legal battles with Coking led him to threaten a return of the cage so he could build around her. Now, the home is uninhabitable, according to an "order to vacate" that hangs outside. The upper floors too unsafe to have anyone venture upstairs. Through a back window, dishes can still be seen in the sink. There's a tear in one of the screens. Coking is in an assisted-living facility in California. There is no cage around the home. Her grandson, Ed Casey, is handling the sale. He declined to be interviewed for this story, citing Coking's dislike of the media and the attention it brought. Attention from not selling the home they now hope to sell. "I've been coming here since I was 18," said DeFederico, now 48. "Selling that would be an end of an era almost." ATLANTIC CITY — Carl Icahn has done what Donald Trump and Bob Guccione could not. Ted Cruz recently released an ad hitting Donald Trump over his attempt to use eminent domain against Atlantic City resident Vera Coking.